The obvious difference between then and now is that Fed Chairman Ben Bernanke has learned from history--not surprising, given that he once studied the Great Depression intensively. Since the onset of the credit crunch in August 2007, Bernanke has repeatedly cut the federal-funds rate from 5.25% down to an effective rate at one point last week of about 0.25%. He has pumped money into the financial system through a variety of channels: in all, about $1.1 trillion over the past 13 months. The Treasury is also active in ways it wasn't during the Depression. Back then, conventional wisdom held that the government should try to run a balanced budget in a crisis, even if that meant cutting welfare spending and raising taxes. A generation of economists inspired by John Maynard Keynes taught us that this is precisely the wrong thing to do. Government deficits in a recession are good, the Keynesians argued, because they stimulate demand. The Bush Administration, which ran substantial deficits in the boom years, looks set to run an even larger deficit now. Indeed, even without the $700 billion bailout, Paulson has already written some big checks--to cover the subsidized sale of Bear Stearns to JPMorgan, the nationalization of mortgage monsters Fannie Mae and Freddie Mac, the bailout of insurance giant AIG and the sales of Washington Mutual to JPMorgan and Wachovia to Citigroup. All of this will cost somewhere between $200 billion and $300 billion. Some say you can't solve a problem by throwing money at it. But that's what the Fed and the Treasury are attempting. Faced with the potential debacle of Depression 2.0, they have tried to calm the fears with up to $2 trillion of liquidity. Call it the Great Repression: a Depression denied. At the moment, a reworked bailout deal seems likely to pass. But the world may still be heading for a severe downturn. Interbank lending remains stubbornly frozen, despite the Fed's liquidity fire hose. With WaMu and Wachovia wiped out, the stampede out of bank stocks and bonds will surely claim new victims. As the recession bites, Main Street firms will start going bust too. And the impact on the $62 trillion market for credit-default swaps could be explosive. What's more, this is no longer an exclusively American crisis. European banks are going under as well. Growth rates in the euro zone and Japan have fallen further than in the U.S. Emerging markets too are suffering. With the exception of Brazil, stock markets in the BRIC economies (Brazil, Russia, India and China) are now down about 40% or more on the year. The notion that Asia has somehow "decoupled" itself from the U.S. now seems fanciful. China and America have come so close to merging financially that we can almost speak of "Chimerica." When Fannie and Freddie were on the brink of collapse, many were surprised to learn that fully a fifth of China's currency reserves was composed of their bonds. Small wonder. Having spent much of the past decade intervening on currency markets to prevent the appreciation of its renminbi, China has accumulated a huge hoard of dollar-denominated bonds. No foreign nation stands to lose more from a U.S. financial collapse. 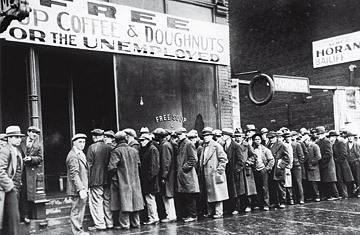 In the end, what made the Great Depression so greatly depressing was that it was global. The combined output of the world's seven biggest economies declined nearly 20% from 1929 to 1932. The unemployment rate soared in the U.S. and Germany to a peak above 33%. World trade collapsed by two-thirds, not least because of retaliation to the Smoot-Hawley tariff. But while we certainly face a global slowdown, we may yet avoid another depression. Now, unlike in the Great Depression, central banks and finance ministries know it's better to run deficits and print money than to suffer massive losses of output and jobs. And the introduction of U.S.-style deposit insurance in many countries means banks are less vulnerable to runs by depositors than they once were. Finally, the possibility still exists (though the odds are slimmer than they were a year ago) that the Asian and Middle Eastern sovereign wealth funds could step in to recapitalize U.S. and European banks before they succumb to another great contraction. Given the immensity of the crisis, a Congress-approved bailout may be just a short-term fix. But a short-term fix is better than no fix. If nothing else, it would signal to the world that--unlike in 1930--the U.S. is doing what it can to avoid financial calamity and sidestep Depression 2.0.